"This is me in cow suit with Dexter and Gordon in full Halloween mode with the milk pail for distribution of milk chocolate." "The one with the wings in the right foreground is the (battery powered) Holy Cow. Each has its own name. Obviously, the list is long. All are gifts from friends and family. Ted is responsible for several. 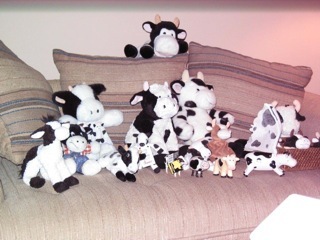 I did not photograph the assorted cow paraphernalia around the house (assorted calendars, tee shirts, note paper, ornaments, cow mugs, moo mixer, and other stuff)." My kids will hate me too! A few people tweeted about my dad stating that eggs are a dairy product. The logic behind the eggs, according to my dad, is that "eggs are in the dairy section of the grocery store, and everything in the dairy section come from cows." It was intentional. Sad and demented, but intentional. Disclaimer: I have young children. This was the best John Hodgeman episode ever, but I couldn't believe no one caught Paul when he said cows give us eggs. Also, I expected a bigger reaction from Jesse when learning about the miniature cows (Dexters). What in the bedevil is a "bread and butter present"? It sounds like code for "I have something for you, but don't get your hopes up." 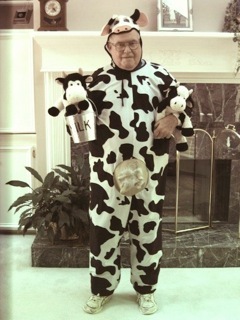 While listening to the Dad, it had occurred to me that he tended to anthropomorphize the cows. And then, in considering that notion, I wondered if Dad was a fan of The Far Side cartoon, where cows, often in ordinary, human, domestic circumstances, are featured. I don't know anyone who isn't t a fan of Far Side. Of course, cow cartoons are my favorites.